Climbing 2,446 steps requires endurance. 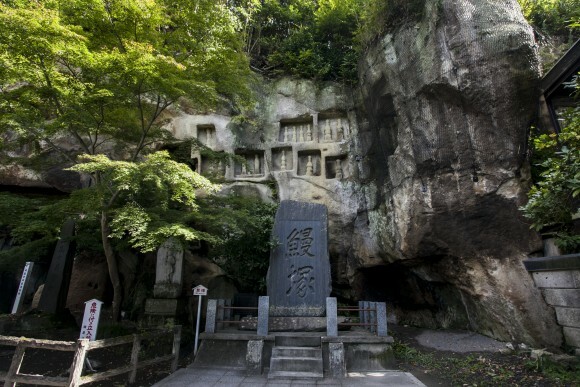 As I made my way up, looking for the renderings of Buddha said to be etched into the stone steps, I began to ponder why Basho (1644–1694), the 17th-century Japanese master of haiku, had journeyed all the way here on foot, from the outskirts of Tokyo. 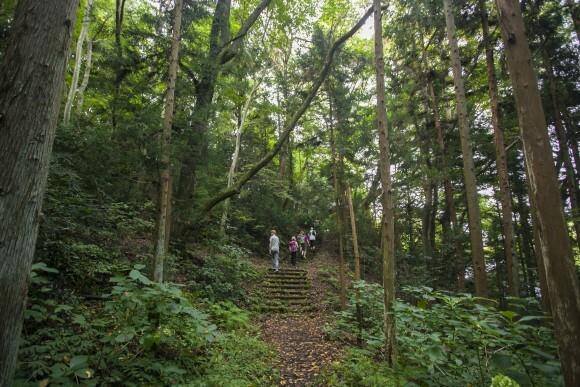 I was on Mount Haguro, one of the three sacred mountains of Dewa in northern Japan. This was one of the stops on a 10-day walking tour organized by Walk Japan, a tour company that specializes in exploring off-the-beaten-path areas of the country, mostly on foot. Led by an American guide who had spent more than a decade living in Japan, our group (one American, two Brits, an Australian, and a Finnish couple) re-traced Basho’s 1689 journey—the final trip of his life—through the northern region of Honshu, the largest island in Japan. 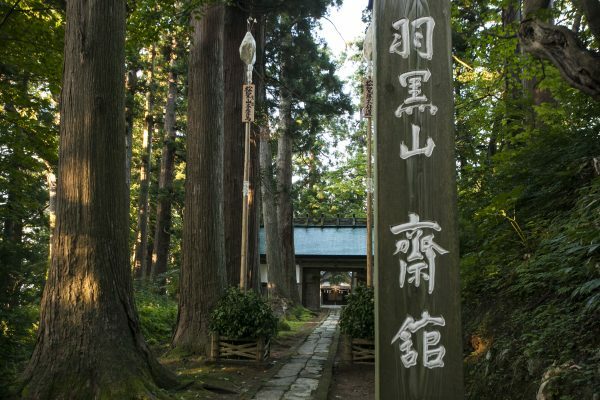 We had as our guiding itinerary Basho’s account “The Narrow Road to the Deep North.” The poet set out from his hut in Edo (today’s Tokyo), traveling up the east coast of Honshu, then descending along the west coast to end at Ogaki. 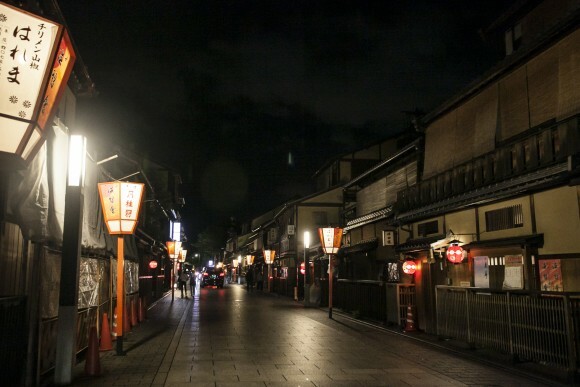 We would trace a similar route, but finish in Japan’s former capital, Kyoto. Basho was prepared to never return from this treacherous voyage. Why would he want to go through such travails? 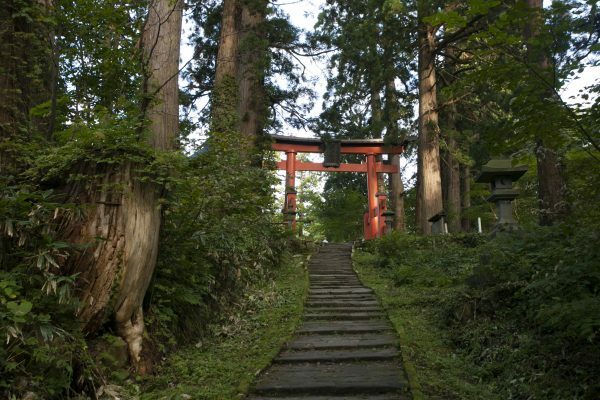 By the time I reached the top, with a towering orange torii gate in sight, I had begun to understand. Bearing hardship is good; it makes the reward that much sweeter. When you make the effort to travel somewhere on your own two feet, the beauty of what you see at the end destination is magnified. 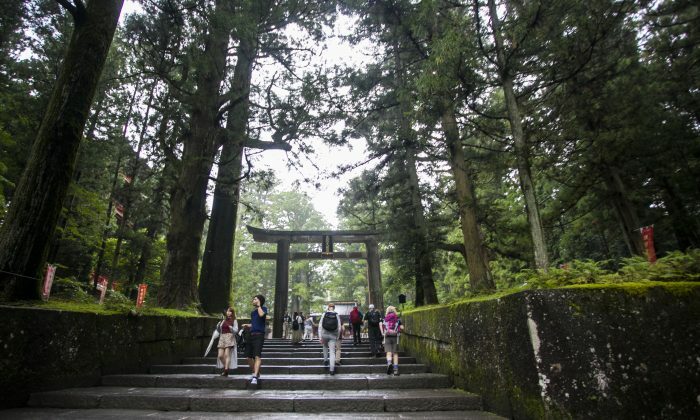 Reaching the summit at 1,358 feet, with 600-year-old Japanese cedar trees surrounding me and the azure sky peeking out from the canopies overhead, I had an inkling of the reverence Basho must have felt upon arriving at the shrine atop the mountain. Start of a summer retreat. Rain was pouring down as we winded our way up moss-covered rocks and wooden stairs nestled between the trees. 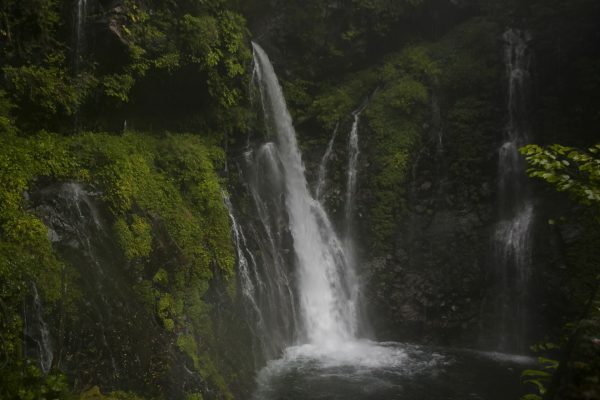 By the time we finally reached the waterfall, the rain had soaked through my poncho and shoes. But the moment I lifted my head, I gasped at the sight—and sound—of the descending water that seemed to gush forth magically from the cavernous rocks. It didn’t matter that my newly bought sneakers were swimming in rainwater, or that my calves were aching from walking more than three miles at a stretch for the first time in my life. Just that morning, I had been in the sprawling metropolis of Tokyo. I have lived all my life in busy, bustling New York City. Doing nothing but walking for hours on end amid forest and along country lanes was at once exhilarating, meditative, and joyous. 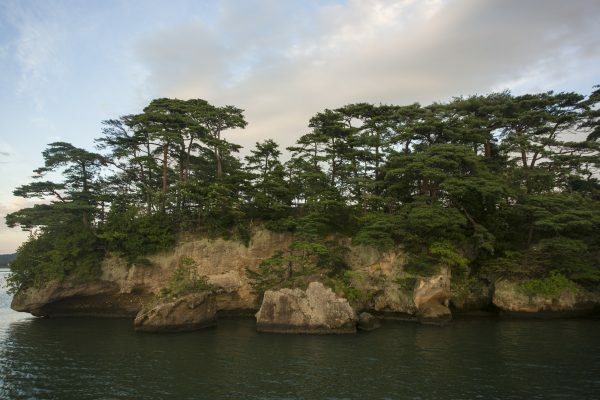 As we sped across the bay on a boat from Shiogama to Matsushima, watching the sun and clouds cast enchanting shadows upon the umbrella-like pines, we could only observe silently this triumph of nature, as if we were moving through a painting. 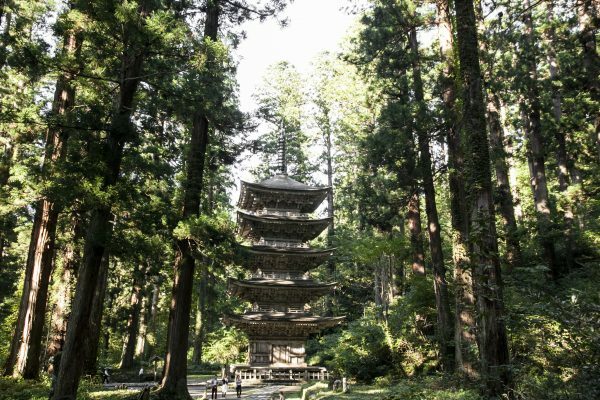 Japan places great importance on preserving its past, whether it’s old trails that ancient travelers like Basho walked, or relics from a bygone city. At the temple grounds, we stood before a rock engraving etched with this poem. Reading Basho’s message of impermanence provided a moment of clarity: Seeing remnants of the past puts the present into perspective. Time flows on regardless; life’s troubles and worries suddenly seemed so insignificant when judged against the long arc of history. 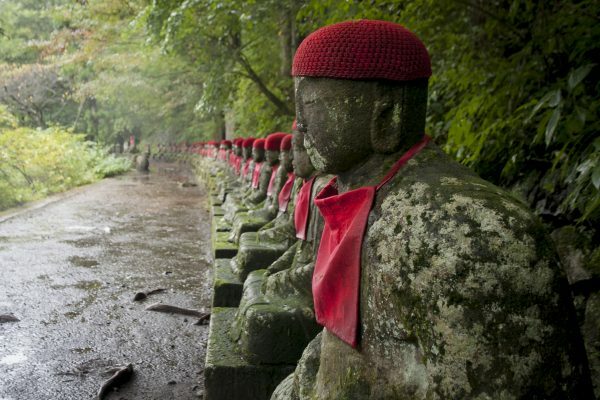 Journeying across Japan on foot, and at times by train, gave us time to soak in the country. With our knowledgeable guide as the conduit, whatever we saw along the way became an opportunity to understand Japanese society and culture. 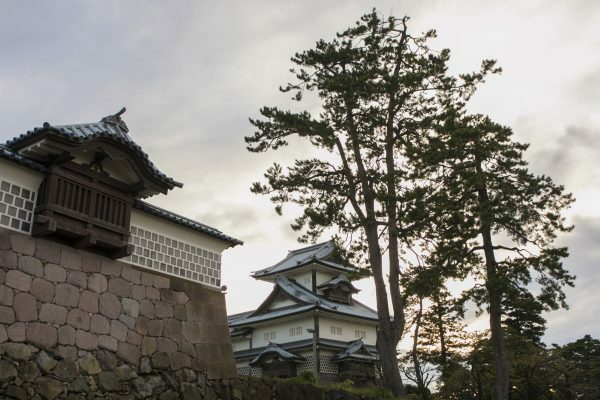 The Finnish gentleman, a photographer who was working on a book about Basho, was ever curious about traces of the poet, while one of our British companions, who had spent part of her childhood in Japan, wanted to know more about the way the Japanese lived. Passing by rice fields—where, as it was late September, the crops were newly harvested and bunched up into bundles—our group once launched into a conversation about the deeply ingrained virtue of honoring one’s ancestors. These lands are inherited through the generations, but even when families no longer subsisted on farming, they refused to sell the land—so as not to disrespect their forebears. 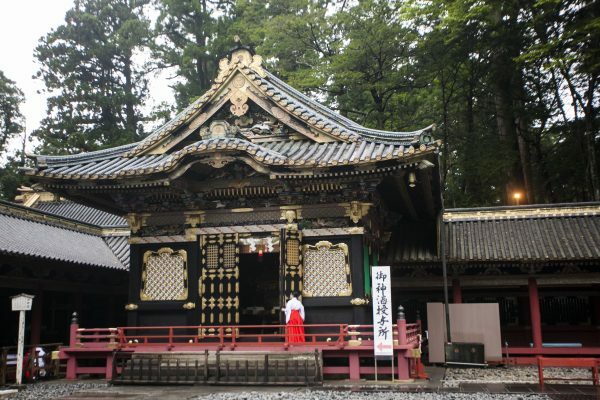 On our journey, we viewed iconography in shrines and temples that showed glimpses of the history of religion and politics intermingling in Japan. 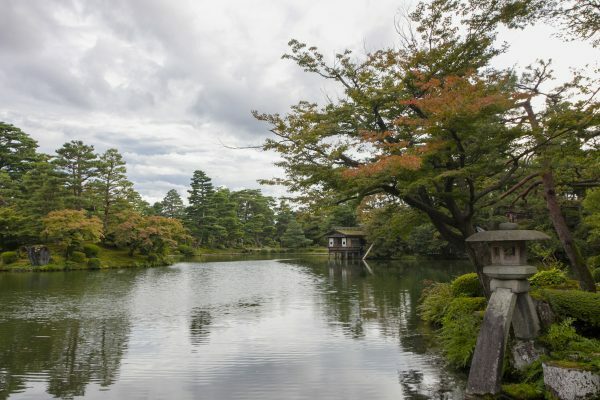 When we ventured into big cities, our guide explained the context behind the exquisite architecture and gardens we visited, so that we appreciated them beyond their physical beauty. We also partook in unique rituals, like communal bathing in a natural hot spring (“onsen” in Japanese) where we were reminded that traveling is as much about pleasure as it is about letting go of fears. For some, onsen bathing (with ladies and men in separate areas) was an opportunity to let go of any insecurities about one’s image, as one must undress completely before stepping into the bath. 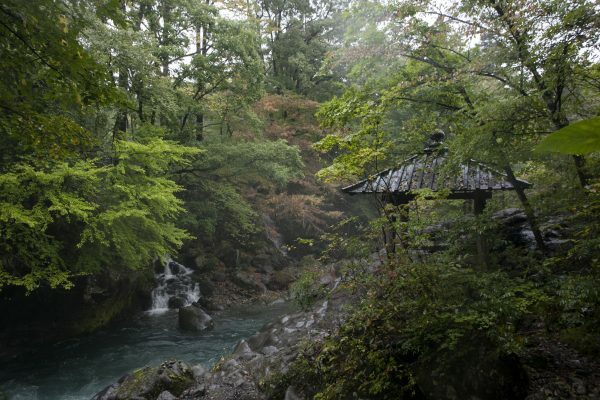 Traditional Japanese inns known as ryokan are typically built around hot springs. 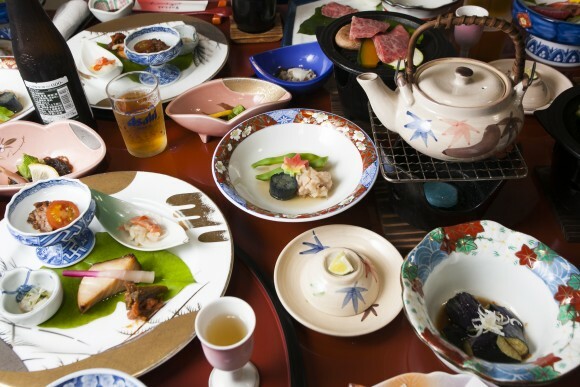 For meals, they serve sumptuous feasts of regional specialties (grilled beef tongue in the Sendai area, or a chewy jelly made from the konjac plant in Yamagata prefecture) and dishes made with seasonal ingredients. Highly treasured matsutake mushrooms are at their peak in autumn. So at an inn in Hiraizumi, we savored the mushrooms’ clean, subtle umami in a broth with gingko nuts, chicken, and shrimp. In another town, we were served a delicate chawanmushi egg custard with bits of matsutake, chestnuts, and fish cake. Every evening, we happily dug into local fish and meat, wild plants—some that we had encountered along the forest trails—and rice grown within the prefecture. 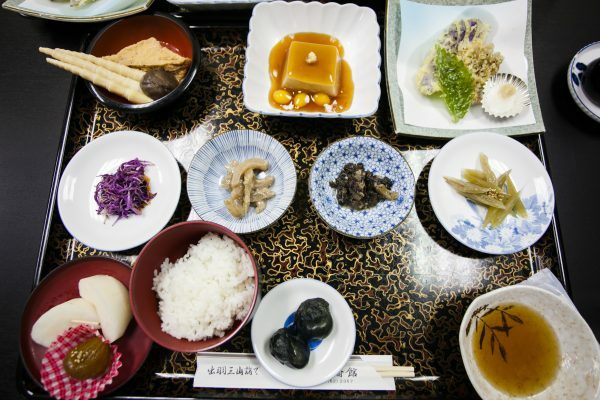 Japanese cooking is all about accentuating the ingredients’ natural flavors. 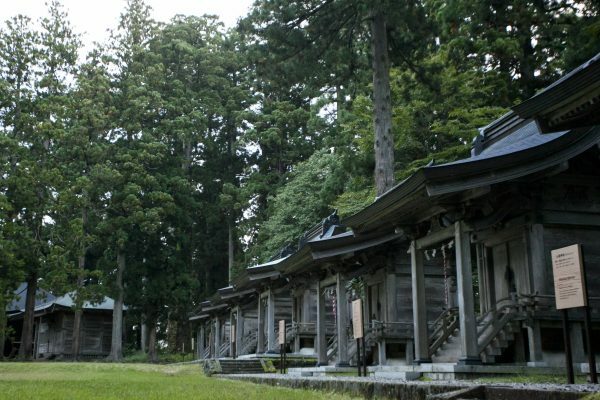 On Mount Haguro, we stayed in lodgings at the shrine and were treated to vegetarian meals prepared by the monks. They had gathered mountain vegetables and transformed them in myriad ways: mixing arrowroot starch into a jiggly piece of sesame tofu; deep-frying maitake mushrooms in tempura batter; dressing chrysanthemum petals with a light sauce; turning the buds of the shiso plant into crunchy, salty grains that popped in our mouths as we chewed. Replenished with energy from the mountains, we set out again the next morning. In Basho’s days, bandits preyed on travelers. 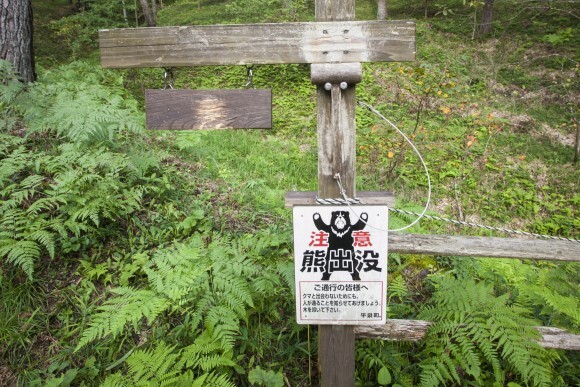 Although the road is no longer perilous, we occasionally had to walk through bear country. While on a forest trail, one of us spotted a black shadow running past. Was it a bear? She wasn’t sure, as the creature moved too quickly. The beast never showed itself, but for the rest of the trip, we looked after each other whenever someone fell behind. We jokingly referred to ourselves as the seven samurai, ready to fend off any hungry animals. It was bittersweet when the tour ended in Kyoto; we promised to meet again the following evening for one last hurrah. At a yakitori shop in Gion—the entertainment district famous for the graceful geiko (geisha) hurrying to their appointments—we reminisced about our trip. I thought back to Basho’s long journey. In his travelogue, he does not explicitly muse on his enlightenments from the voyage. At a historical site dedicated to Basho, I had asked a staff member why he thought the poet made this trek. 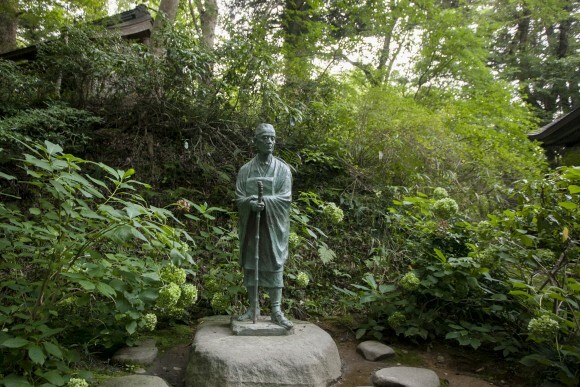 He told me that Basho believed that for one to write good poetry, one must travel. Perhaps that kind of sentiment also rang true for us: To live our existence fully, we have to experience both the joys and trials of wandering afar.